For a match that received an unfathomable amount of hype, Liverpool vs Manchester City didn’t disappoint. 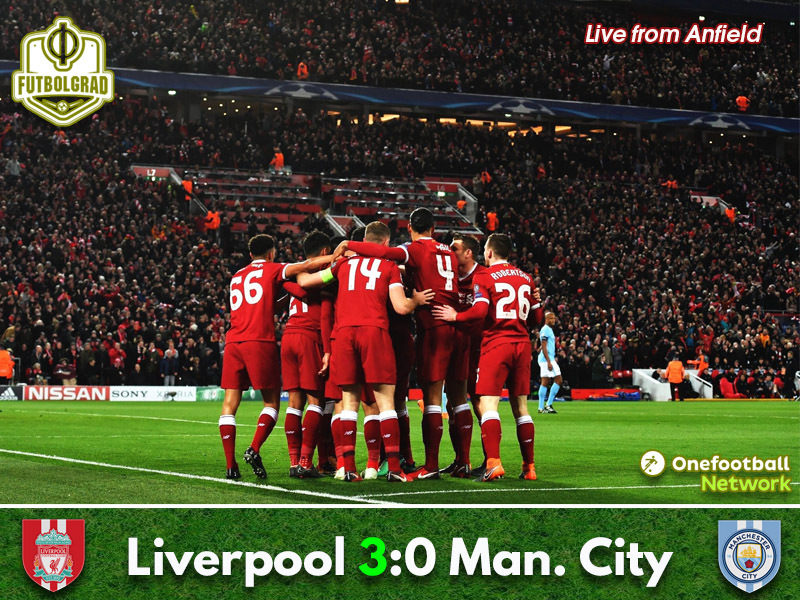 The Champions League knockout stage exploded into life at Anfield as the hosts ran out 3:0 winners. Liverpool set their stall out from the very first minute. Forced to attack the famous Kop end, after losing the toss to their vistors, it took sixty seconds for the Reds to register their first chance. Andrew Robertson cut down the home side left and almost picked out top scorer Mohamed Salah – Aymeric Laporte stepped in to clear the immediate danger. A raucous opening gave birth to an end to end, high tempo fixture – both sides intent on out-pressing the other. It took just 12 minutes for the opening goal to come; Salah broke down the wing and fed Firmino – the Brazilian snapped at his shot, Ederson saved but it was the Premier League’s hottest property who pounced quickest. Salah composed as ever, lifted the ball into the net. Anfield erupted, 55’000 sounded double that as a passionate crowd screamed in unison. City weren’t perturbed, the early goal didn’t change their tempo nor their desire to attack. Pep Guardiola’s side pressed for an equaliser, as they did Liverpool in turn matched their pressing – it was a remarkable game and it was barely 15 minutes old. If Anfield was rocking early on then Alex Oxlade-Chamberlain took it up another level. The ex-Arsenal player rifled an unstoppable shot past Ederson as the clock passed the 20 minute mark – Liverpool were in dreamland. For all the pre-match hype, this game had delivered after only a quarter of the fixture. Liverpool’s front three had City falling over themselves – for the Manchester side it was about to get worse. Sadio Mane, sent off at the Etihad in September soon added another. Nicolas Otamendi could only pick out the red hot Salah and the Egyptian exploded down the right wing. Floating a sublime cross to the far post it was the Senegal forward who rose the highest, Liverpool had their third on the half hour mark. City for their part, looked dishevelled – as the half time whistle approached De Bruyne wasted an excellent opportunity to put Liverpool under pressure from a direct free kick, 20 yards out. The Belgian floating the ball over everyone and out for a goal kick – Guardiola screamed in frustration and with that the Sky Blues had been thunderstruck by Klopp’s attacking machine. The Catalan coach must have been seething at half-time, his response? To send his team out early, as the game kicked off it was evident why. Three-nil down he wanted an immediate response – to his players’ credit he got one. First Leroy Sane, then Vincent Kompany went close to pulling one back for the visitors. Short on final quality but at least the Premier League champions elect had found their second gear. City sent wave after wave of attack forward in search of a crucial away goal – it was the host’s turn to be subjected to a tirade of fast football, Liverpool were just about holding on. Red hearts sank as Salah left the field injured on the 52nd minute, without the Egyptian Liverpool looked slow. As the half moved on the hosts looked sluggish, had their explosive first half taken its toll? Roberto Firmino was the next to be replaced for Liverpool, Dom Solanke replacing the Brazilian. Meanwhile, City looked to Raheem Sterling to inject some pace into their forward line – and inject it he did. The England international immediately created problems for Liverpool. Booed with every touch he settled quickly to link up well with a now high performing De Bruyne. The vistors just couldn’t find the killer pass to undo Liverpool – a side that began to show it could defend, as well as tear teams apart. As the final whistle went Liverpool had held on for a wonderful victory, but crucially it came without the expense of an away goal. It became evident from early on that Pep Guardiola had identified Liverpool’s right side as a weak point. Mistakes against Manchester United and Crystal Palace had seen the young defender subjected to criticism. Tonight the 18-year-old was to answer back in the most spectacular of ways. Sane, David Silva and Laporte all tried – but the ‘Scouser at the back’ patrolled them like someone with years of Champions League experience under his belt. 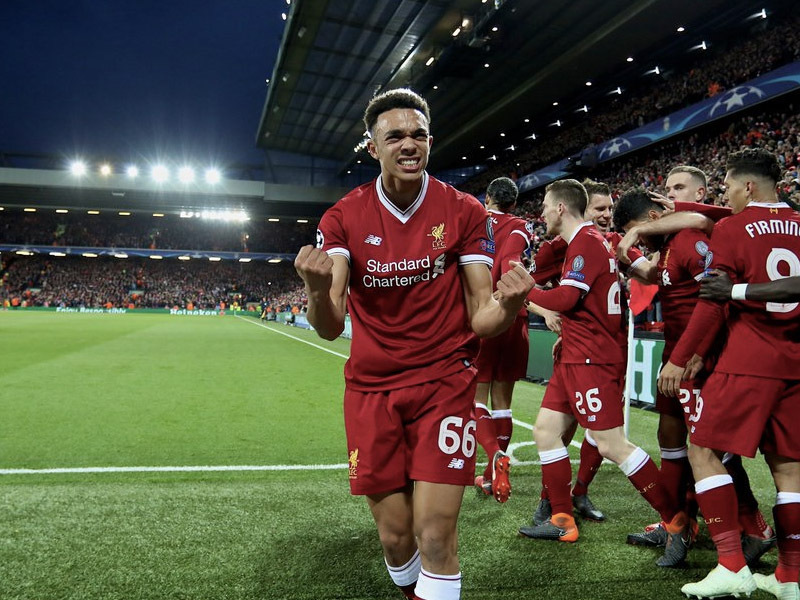 On a night Liverpool needed something spectacular, it was one of their own who was to shine brightest. Blown away at Anfield in January, City were guilty of allowing their hosts to find their devastating rhythm from the first minute. When they finally found a modicum of quality to test Klopp’s side, they still failed to register one shot on target. If Guardiola has any hope of reaching the next round he will have to ensure City operate on a much higher level. Guardiola’s side fail to register a shot on target.